Minister Regev refers to Draft Law crisis and PM investigations, answers whether she would visit Amona despite order prohibiting entry. Culture Minister Miri Regev referred before today's cabinet meeting to whether the Draft Law would bring down the government, claiming there was no reason for the government to fall because of this. "If Lapid and Liberman vote in favor then this law will pass even if the haredi parties don't vote for it," Regev said. 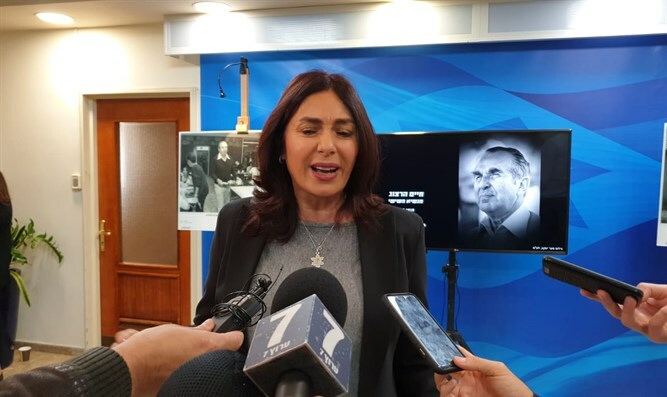 "As it looks at the moment if the law passes and the haredi parties won't leave the government and coalition, then the law will pass and the coalition will survive," Regev said. "There are those who are always trying to find crises to try to bring down the coalition, so first of all it's clear to us that the Prime Minister can serve until the court says otherwise, and therefore no utterance or decision by the Attorney General will topple the government. The Prime Minister has the presumption of innocence until the court says 'guilty' or 'not guilty' and therefore the Prime Minister will continue to serve as prime minister. "It's worthwhile for the haredim to pass this bill because for the first time a law in the State of Israel would regulate haredi recruitment correctly and in proper measure after sitting for three or four years to prepare a law that can be agreed upon by everyone," Regev said. Regev said, "I have no intention of violating a commander's order, but I do intend to go to Amona and encourage the residents."